A recently released study on hygiene in Cambodia has found that a lack of understanding of the dangers of handling child faeces is causing serious health problems. Data collected by the London School of Hygiene & Tropical Medicine and Phnom Penh-based hygiene and sanitation NGO WaterSHED show a lack of hand-washing after handling soiled diapers is putting children at risk of contracting diseases. Globally, faecal contamination causes nearly 800,000 infant deaths each year. 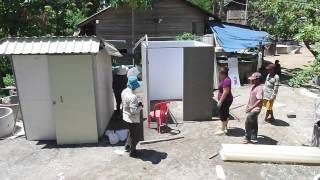 WaterSHED recommends continued efforts to expand the amount of toilets Cambodians can access, especially in poor areas. UNICEF hygiene expert Sopharo Oum said in an email yesterday that education could stem problems arising from child feces. “Awareness raising and ways to change the behaviors of caregivers [could improve child waste sanitation],” he said.